This deck is designed to fit a diecast ADC Modified chassis. 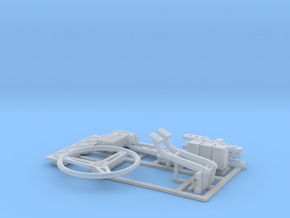 It is one piece and fits into the ADC screw holes for the original body with epoxy and places your body in the perfect location to get the correct ride height and perfectly located wheel openings. This product is made from the SWF Polished material and will require you to finish the raw body with filler primer and sanding. With a little work a smooth finish can be accomplished. This deck is used for all conversion body styles.